For a few days every year, New York City’s borough of Manhattan becomes one of the most beautiful places in the world. Don’t get me wrong, New York City is always pretty cool, but twice a year there is a special convergence of natural and man-made beauty that is unmatched in the rest of the world. It’s been dubbed Manhattanhenge, and the city’s big east-west streets (like the famous 42nd Street) perfectly frame the setting sun. 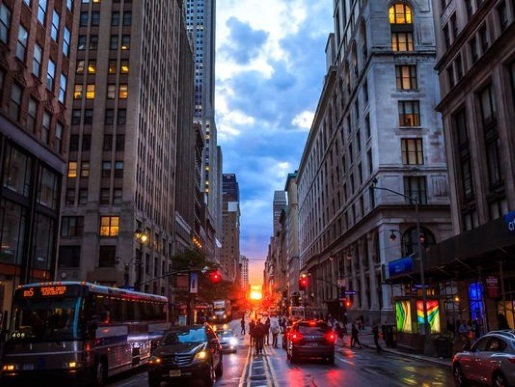 The last Manhattanhenge of the year will be tonight at 8:21. “For Manhattan, a place where evening matters more than morning, that special day comes twice a year, when the setting Sun aligns precisely with the Manhattan street grid, creating a radiant glow of light across Manhattan’s brick and steel canyons, simultaneously illuminating both the north and south sides of every cross street of the borough’s grid. A rare and beautiful sight. These two days happen to correspond with Memorial Day and Baseball’s All Star break. Future anthropologists might conclude that, via the Sun, the people who called themselves Americans worshiped War and Baseball,” writes astronomer Neil Degrasse Tyson of the Hayden Planetarium. If you miss Manhattanhenge, don’t worry; the next one will take place in late May 2016, depending on the placement of the sun. As usual, there will be a half-sun Manhattanhenge and a whole-sun version. Until then, feel free to visit the original Stonehenge. It won’t always be a solstice calendar, but it’s always going to be awesome to look at just the same.